The beautiful old trees in the grounds of Stülpe Manor seem to be living sculptures, moving in the wind. The greenery has had much to endure in recent years, paths and sight lines having been lost, thus breaking up the harmony between architecture and nature. A scientific program now aims to restore these old structures and return the overgrowing work of art, in which a wide variety of botanical treasures blossom, to its former breath-taking beauty. Without violated nature, without “artificial” greenery, without precisely measured pieces of turf. The historic orchard will also be rejuvenated and replanted with ancient fruit varieties. Thousands of rose bushes have already been planted, enclosures reconstructed. A special feature of the park pertains to the many varieties of trees of contrasting growth habits and colours that create a striking horticultural composition. Another characteristic of the park, rarely seen elsewhere, is the integration of agricultural land into the grounds’ vistas. It is this spaciousness which renders the grounds an ideal location for strolls and a natural backdrop for splendid festivities. Stülpe Manor lies in the largest uninterrupted landscape conservation and right in the middle of the wildlife corridor running through Southern Brandenburg, along which wolves, elks and other wildlife from former East Prussia (now Poland) return to the area. For anyone seeking unforgettable experiences in unspoiled nature, off the beaten track and beyond the din of modern life, Stülpe Manor is the right place. In recent years, wolves have begun settling in the nearby nature reserves spanning hundreds of acres and are now raising their offspring there. The fallow deer population numbers among the densest in all of Brandenburg. Fens make way for heathlands, the beauty of which rivals that of the Lüneburg Heath. Just behind Stülpe rises the Golm, its forests populated with ancient English oaks and a crystal clear mountain lake. The Golm is the highest elevation of the Lower Flaeming with views that stretch to the rivers Oder and Elbe and even to Berlin. This is the nesting place of the white-tailed eagle and the territory of sixteen of the eighteen bat species inhabiting Brandenburg today. The list of animals which have found their little paradise on Earth around Stülpe is a long one: The crane. The otter. The great capricorn beatle. To name just a few. We can arrange guided excursions through the wilderness under the expert guidance of our district forest rangers and ranchers. Or how would you like to hike along well-signposted trails, supported by GPS navigation, starting right at the manor’s doorstep? There are also 250km of skating track, the largest in Europe. It goes without saying that we provide the equipment and show you the ropes. Stülpe is also part of the largest Nordic walking network in Brandenburg and is directly located on the cycle route Berlin – Leipzig. Or would you prefer a wild (or not so wild) cross-country ride on a beautiful steed? One can easily picture a group of horsemen and -women breaking through the underwood at dawn. You do not know how to ride a horse? Well, then you should learn how to do soi. We are certain that we will have no trouble finding the right horse for you in the stables at Stülpe Manor. 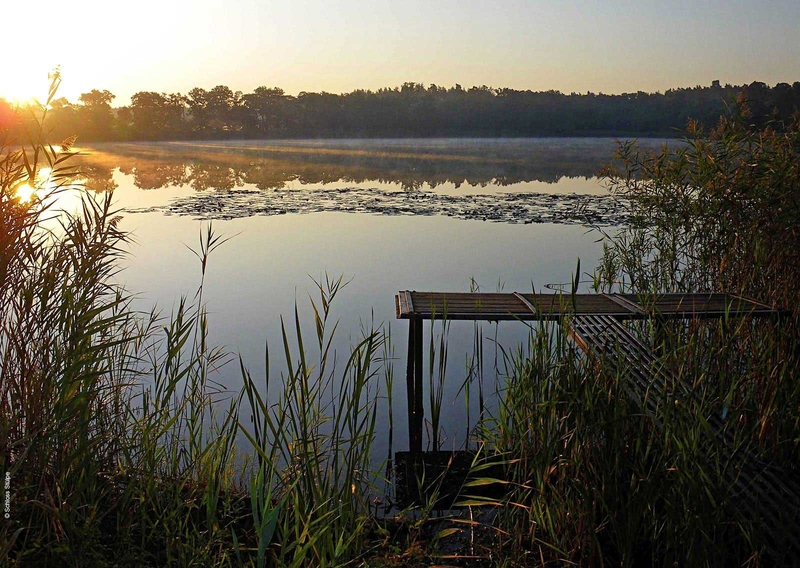 Does having a swim in Stülpe Manor’s own historic lake Holbeck sound more enticing do you? We will happily arrange guided tours of the surrounding area for you. The Spreewald, Lutherstadt Wittenberg, Jüterbog and Potsdam or the birthplace of Werner von Braun’s rockets are all within reaching distance. Stülpe offers countless ways to be active.